Thought I would pop way from my kitchen long enough to say "Hello" to you all. I am a Neoclassical (Big word for taking the tried and true works of masters and updating or bringing the now or hip versions to the masses) trained Chef who had a bout of a illness that has left my left foot slightly paralyzed. I hold my faith as a strong inner part of myself that I rarely see any reason to outer express to others. But I do answer when people ask me what I believe in. I am Catholic/Orthodox with leanings towards Shamanism. I am absolutely fascinated by Rootwork and Herb Magic. I just purchased your Hoodoo Herb and Root Magic book and believe I will fully enjoy it. I already enjoy your sections and articles on Theory and Practice. Plus the Herb Magic sites and tips. All that probably has to do with my intense usage of herbs and spices in my cooking and personal life. I have known for years that food and cooking can change a persons attitude or mood. Ex. We all have a treat, drink, or goodie that makes even a horrible day at least manageable once we dig in to it. And for quite a few of us that special thing does not have the same results if it is not from the same source, be it made by a certain person or ourselves, or a certain brand that almost religiously buy every time. So it is not a short walk indeed for me to believe that ingredients have powers. That Food is Magic. That nearly ever cook, chef, person making a meal for self or others is a Conjurer. I am also borderline obsessive about cooking and food (If you have not guessed). And have a case of ADHD so bad at times that goldfish have a longer attention span than I do at times. Hello, Chef Pug. If you like cooking and magic together, you might want to check out the two books our church has published on cooking with magical ingredients -- and perhaps you will enter a recipe for the 2012 Hoodoo Food cookbook as well! Cooking with magical herbs is a time-honored form of domestic spell magic. Practitioners often prepare foods to enhance love, sexuality, fidelity, and for peace and protection in the home -- and have been also known to sneak a not-so-nice trick into a tasty treat to get co-workers to stop gossiping, to gain control over a lover, or to drive an enemy away. 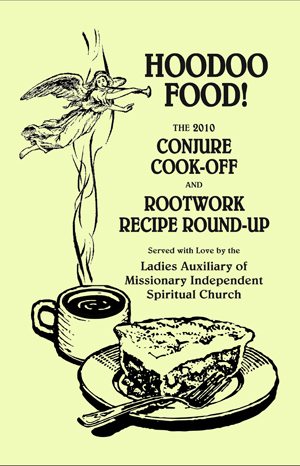 This booklet will get you started cooking with hoodoo herbs -- and may encourage you to enter the annual Conjure Cook-Off and Rootwork Recipe Round-Up sponsored by The Ladies' Auxiliary of Missionary Independent Spiritual Church, (All proceeds from recipe booklet sales benefit the church.) 16 pages, stapled booklet. 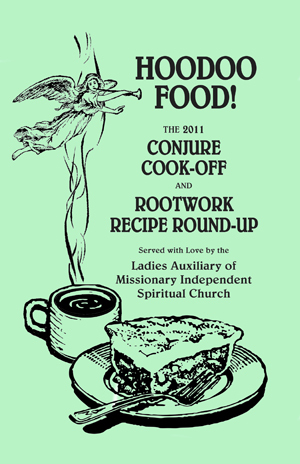 The Ladies Auxiliary is back -- with the second annual Conjure Cook-Off and Rootwork Recipe Round-Up cookbook featuring magical foods from contributors all around the country. We know you will want to prepare and sample these brand new taste-treats that incorporate hoodoo-style herbs and spices traditionally used in spells for enhancing romance, promoting prosperity, attracting abundance, and providing protection. Even if the ingredients were not magical -- Hoodoo Food is mmmmm, sooooo good! Great Intro! Welcome to The Forum! Thank you all. First I like Cat to know i am eyeing those cookbooks and will get them as soon as i make up my shopping list of what i need to Conjure with. Second jsut wondering how long will every post i write be held back and reviewed first? Saw a posting that suggested the first 3 or so. But just wondering for sure. Welcome to the forum Chef Pug! Only your first three posts are held for review. Welcome to the forums. I believe you are in good company here. Hey Chef Pug. Welcome! Yeah for food and conjure!